The principle of fitting saddles is the same whatever the type of saddle and should be done with your horse standing squarely on level ground with his head and neck straight ahead, do not use a numnah. Place the saddle slightly forward on the horse's withers and pressing down on the pommel, slide the saddle rearward until it stops at the resting place which is dictated by each horse's conformation and will always be behind the horse’s shoulder blades. Too far forward will interfere with the horses movement. 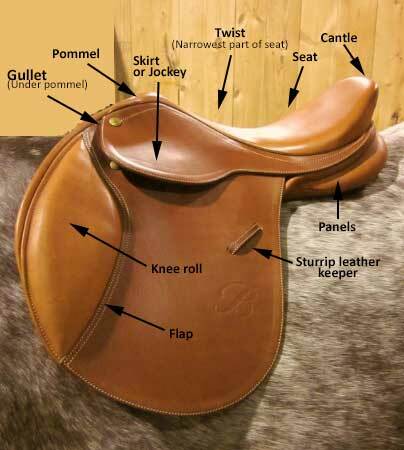 The points of the saddle are found in the point pockets, one on each side of the pommel of the saddle under the saddle flaps. The points should lie parallel to the withers. If the angles are too narrow, the points will dig into the muscles and also cause the middle of the saddle to be in uneven contact with the horse's back. If they are too wide the saddle will sit on the withers. To check the point angles, stand looking from the front with the flap lifted; the points should be parallel with the musculature within 10 degrees of the heaviest side. Place one hand in the centre of the saddle and press down to secure the saddle in place as you test for panel pressure. Run your other hand between the front of the panels and your horse's musculature and feel for any uneven pressure under the points. While maintaining pressure on the top of the saddle, run your hand, palm up, under the entire panel along the back feeling for even pressure. There should be adequate clearance between the pommel and the top of the horse's withers, approximately two to three fingers. More than three fingers’ clearance may mean the pommel is too high, i.e. the tree is too narrow. A saddle with less than 2-3 fingers may mean that the saddle is too wide. Horses with flat, round withers may have more clearance than usual under the pommel. In these situations you may need to rely more on the balance of the seat and pommel to cantle relationship. On horses with high, narrow withers maintaining proper clearance is something that has to be monitored and maintained. This video shows how to fit exercise boots. Fitting tack is a practical skill and this now should be practiced.